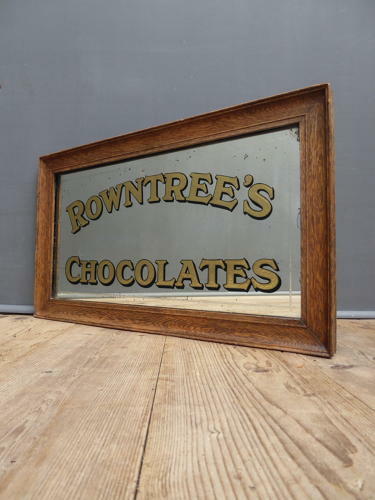 A beautiful & very rare early antique advertising mirror for Rowntrees Chocolate. A wonderful advertising mirror featuring a thick glass mirror plate embellished with beautifully detailed gilt lettering & a lovely simple border in a silver. Set in its original solid oak frame of the highest quality. An absolute stunner! Wear commensurate with age, very good overall condition with some expected light foxing to the mirror plate & historic restoration to the frame in places. Displays beautifully, back original & a little loose but secure. Due to the age, weight & fragile nature of this piece, we strongly recommend it is collected in person. Please do however, afeel free to get in touch should you wish to send a courier.